This recipe serves two people as a main dish or four as an appetizer. Cut two six-inch segments of baguette, slice each segment in half lengthwise, and toast. Drizzle each piece of toast lightly with olive oil. Peel and halve the garlic clove, then rub each half over two pieces of toast. Discard the clove or save for another use. 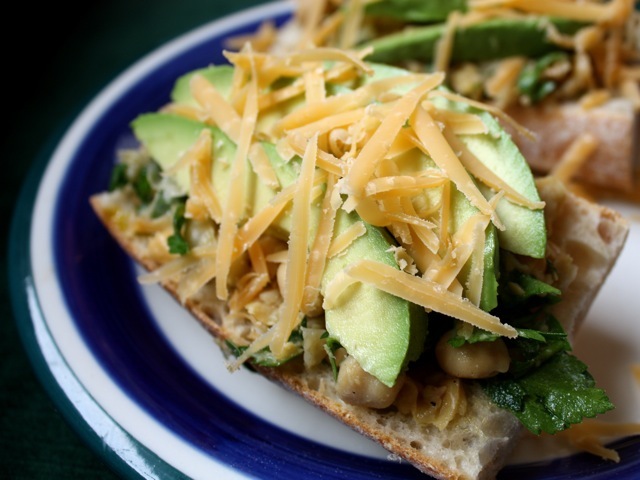 Spread one quarter of the chickpea mash atop each toast. Slice the avocado in half and remove the pit; peel and thinly slice each avocado half lengthwise. Cover each toast with overlapping avocado slices. Slice aged Gouda into matchsticks, scrape into curls, or simply crumble atop each sandwich. Add more salt, pepper, and lemon juice to taste.